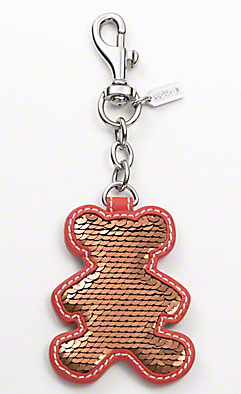 Coach’s bear keychain is a Gingerbread Bear to me! Coach just sent me an email asking if I would tell them about a recent purchase… which I haven’t made so I need to ask around the house. In the email were pictures of purses and up on the corner was a Gingerbread Bear keychain. They don’t call it a ‘Gingerbread’, but it looks like one to me! How about you? You can see more views on the Coach site. Just more fun.